I don’t think most pundits or fans have fully grokked how good the Big 12 might be in 2017. Everyone in the 2008 Big 12 season had a pretty good QB except Colorado. Seriously, everyone else was at least respectable and as many as eight of these guys could have been (or were) in contention for 1st or 2nd team All-B12 in another year. The competition that year was obviously pretty tremendous and the season ended with a three-way tie atop the Big 12 South between Texas, Oklahoma, and Tech that was settled (basically) by the same overpowering numbers that propelled Sam Bradford to the Heisman trophy. In the years since 2008 there hasn’t been quite the same level of excellence across the position group in the league. In fact, if you had a really good QB in between 2008 and now you were probably at or very near the top of the league that season. The 2013 season was the low point, a year in which the first team QB was Bryce Petty but the second team guy was Oklahoma State’s Clint Chelf and freshman Baker Mayfield was an honorable mention. 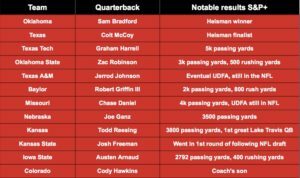 The 2016 season was one of the better ones we’ve seen in a while in terms of QB play with Baker Mayfield, Pat Mahomes, Mason Rudolph, and Jesse Ertz all putting together impressive seasons. Obviously the kicker for 2017 is that everyone but Mahomes returns, guys like Jacob Park, Kenny Hill, Shane Buechele, Zach Smith, and Carter Stanley are back with starting experience. Meanwhile West Virginia is adding former starting Gator QB Will Grier (assuming he’s off the hook from PED suspension in time for week one, which WVU seems confident he will be). We got to see Grier in the West Virginia spring game and he showed nice command of the offense and the arm to push the ball down the field. I’d like to talk just briefly about who’s out there and a snapshot into what they might be this season. We’ll go into greater depth later, hopefully with some choice schemes drawn up and perhaps with some radar charts of their skill sets if I can figure that out. I’ve got an Athlon feature on Mr. Mayfield coming out this offseason but suffice to say he’s the most heralded starting QB around the league and currently carries the B12 QB1 belt around. He’s good in the spread-option game making quick decisions, he can throw down the field and hit deep throws, and he can run around a bit as well both in the QB run game as well as with an improv act to buy time or find yardage. Mayfield fits comfortably in the Big 12’s tradition of scrappy, versatile, undersized spread QBs like 2008’s Chase Daniel, Todd Reesing, and Colt McCoy. The Sooners need to continue to surround him with great players but I’m pretty sure that will happen. Mayfield’s versatility and ability to play off the surrounding talent at OU makes him special but Mason Rudolph IS the offense at Oklahoma State. Gundy runs a “pro-style spread” attack that works best when it combines vertical passing elements with a run game in a “spread Air Coryell” type fashion. I believe Rudolph is the best signal-caller he’s had yet and the Cowboy program is pushing every chip they have into the pot this year, featuring former 5-star LSU WR Tyron Johnson ready to go after a transfer redshirt year, incoming Cal LT Aaron Cochran to replace UAB transfer Victor Salako, Rudolph and his top targets James Washington and Jalen McCleskey (reigning MOTP), and also big Marcell Ateman who missed last year with injury. They’ll be exceptionally dangerous this year working vertical route combinations, particularly if they can keep their run game going with RB Justice Hill. Sooners fans will object but I’m starting to think Oklahoma State might be the real frontrunner in 2017 and Rudolph is at the center of it. The Wildcats are also all-in this season due to it potentially being Bill Snyder’s final year as head coach. They have a returning starter in Jesse Ertz who ran for 1k yards last year after mastering their single-wing run game and who’s probably also a tad underrated as a passer. He was learning to find Byron Pringle last year and they add Cal transfer (everyone is leaving Cal these days) Carlos Strickland to the mix as well. This is going to be a very good offense and Ertz was really coming along. He’s a bit faster than people think and a tougher runner than most realize as well, just go ask TCU LB Travin Howard or any of the other players that tried to tackle him from the side only to find themselves getting stiff-armed to the turf. The last time the Wildcats had a tough runner at QB that could also find guys out wide in the passing game they won the league. After the spring game it’s pretty clear that Buechele is coming along pretty well in the Texas offense and will almost certainly be the guy in 2017. The Longhorn offense is still very much a work in progress under Tom Herman but they have found a future NFL WR in Collin Johnson, a future NFL OT in Connor Williams, and need only to fill in some pieces around them to have a B12-contending offense in 2017. Buechele needs to be Trace McSorley in 2017, running the ball well and often enough to serve as a constraint for the feature backs and hanging in the pocket to deliver throws down the field. If that happens and the D continues to gel, Texas is every bit as much of a contender as the three teams listed above. Much like in 2008, Baylor has a very promising new coach and young QB taking over but history’s pendulum of good and bad timing is swinging back hard in Waco’s face. Just as 2008 was a bad year to break in a new QB and system (unless you consider it a plus to lose often and fly under the radar, which is debatable), the early 2010’s was the perfect time to have that QB and system humming because Texas and OU were down. Baylor fans will probably treat this as disrespect but it’s a fact of history that Texas and Oklahoma were struggling some when the Bears won their Big 12 titles with Art Briles. We simply didn’t get any big time bouts between those Bear teams and nationally competitive bluebloods at the peak of their powers. The closest we got was Michigan State in the Cotton Bowl and the home win against OU in 2011 that resulted in RG3’s Heisman trophy. Ironically, Baylor would have been right up there had the Briles program not imploded and Jarrett Stidham not jumped ship for Auburn. Stidham was the most talented passer yet in a passing-oriented system. However, Zach Smith has big time potential as well and could end up being the most talented pocket passer of this entire group. Hopefully Matt Rhule has some strong memories of how the Giants teams he coached on utilized Eli Manning opposite those excellent New York defenses. Even if so, I’m guessing that like RG3 we don’t see it come together in Waco until 2018 or later. I’m still breaking down the WVU spring game but there’s a chance they have an offense in 2017 that’s a full tier above where they were at in 2016. That will depend some on health on the OL and how good this cast of wideouts proves to be but Will Grier is a big time talent at QB such as Holgorsen hasn’t had since Geno Smith or Brandon Weeden. They are using some Briles-esque wide splits in their spread-I sets, much like Gundy’s ‘Pokes, and taking full advantage of how difficult it is to handle WRs playing in tons of space while minding the run game. That’s made possible only when you have a strong-armed QB that can make quick decisions and they appear to have that. If they somehow have more Rasul Douglas’ sitting around waiting to go on defense they too might end up challenging the top dogs. Hill was pretty spotty in 2016 and struggled in the spring game (reportedly) going up against a very good TCU defense. I think we can expect to see Cumbie simplify things a bit in Ft. Worth, work the run game more, and try to prevent Hill from having to do as much in the passing game. That approach would have the added benefit of helping the Frogs avoid an identity overhaul if Shawn Robinson proves to be the best option during the season. Anyways, Hill needs to run for 500 yards next year or the Frogs probably don’t contend. Much like Arnaud in 2008, Park is pretty well under the radar for a solid player with some nice weapons around him. The Cyclones are going to fight like mad to be bowl eligible next year and Park’s ability to hit Allen Lazard and Deshaunte Jones will be the key factors. I haven’t scouted Park much for strengths and weaknesses yet but definitely has some mobility and arm strength to stretch the field if they can rebuild their OL and get Mike Warren going again. I thought McLane Carter might steal the top job but it appears to be Shimonek’s for now. I don’t like betting against Kliff Kingsbury offenses and they still have a ton of dangerous wideouts on the roster although I’m not sure they have any that teams will worry about bracketing outside the hash marks. Shimonek needs to show some mobility to make things happen if protection breaks down and he needs to find WRs Derrick Willies or Dylan Cantrell deep and outside or this thing unravels quickly and Kingsbury sends the second half of the year monitoring OC openings around the country. This may also be Peyton Bender, it’s as of yet undetermined. Either way, Kansas is going to feature a guy that knows where the ball should go and lean on a pretty talented WR corps to make things happen. When they play teams that can blister through their OL or match up with enough DBs out wide, they’ll get shut down, but if you can’t do those things they’ll be plenty dangerous. I’m guessing Kansas will have a win or two next season in Big 12 play that subsequently spoils the season for that team (unless it’s Tech). The 2017 season is going to be an all-out brawl between all of the QBs primed for big years. The top returning starters all have a lot to play for and then there are some newcomers or rising players that will be hungry to steal top spots. I don’t think we’ve seen anything quite like it since 2008 and I think we all remember how fun that season was. So, Nickel Rover is a Heinlein fan? I’ve not read any of his work, actually. I’ve seen Starship Troopers but I understand that’s not representative of Heinlein’s novel. He coined the term “grok” in Stranger in a Strange Land. It’s spread in the last 50+ years, though, so you’re liable to have seen it elsewhere. Oh yeah, I see that all over the place. It’s a fun word.